In the ‘Molenberg’ family farm in Blaasveld, the Van Breedam miller's family ground and distilled grain into jenever. Since 1637 this family tradition was passed on from generation to generation until in 1927 the last distillate was made. Louis Van Breedam and his sister Anna left the ‘Molenberg’ in 1872 and took over the brewery in Mechelen which had brewed beer for the Groot Begijnhof and the city since 1471. And this started a new family tradition. The distillery and brewery are still owned by the family and the tradition lives on. Charles Leclef, fifth generation Het Anker brewery-owner, grew up in the brewery but also knew the former family distillery in Blaasveld, inactive since 1927, where his uncle lived. He had a daring plan: the combination of both family traditions, distilling and brewing. To distil whisky you need to respect the rules. 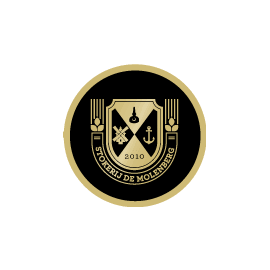 De Molenberg Distillery is Belgium's first whisky distillery where two hand hammered, copper pot stills are used. This slow, double distillation process guarantees a pure and refined spirit, which is then matured in oak barrels. The result after 3 years of aging is a refined whisky with a pure and balanced taste. And that completes the cycle: the family’s brewing activity originated from the distillery and in turn today the brewery provides the basis to restart the distilling tradition.